Original Schumacher tyres included. Transmission upgrade available to handle modern high powered motors, and create a class leading buggy for historic RC racing.Specifications Motor (Maximum 17.5T limit with kit transmission, 6.5T with speed secret pro transmission). 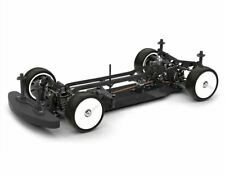 Schumacher Cougar SV Pro Carbon Fiber rolling chassis buggy with included box and manual. Also available are two bodies, one candy purple (missing a little paint at left side of roof when used on another Cougar) and the other black, both in good condition. This is the Schumacher Mi1v2 1/10 Electric Touring Car Kit. The Schumacher Mi1v2 is an. ideal choice for a first “Race Car”. The Mi1v2 is simple to maintain, durable and above all, great to drive! your budget, check out the Schumacher Mi1v2. It is in fair condition, normal wear. See pics for exact condition and parts included. This is the Schumacher Mi1v2 1/10 Electric Touring Car Kit. The Schumacher Mi1v2 is an ideal choice for a first “Race Car”. The Mi1v2 is simple to maintain, durable and above all, great to drive! With an efficient transmission and precise CNC machined motor plate, it handles like a dream. Schumacher K170 Cougar KC Astro & Carpet Spec 2wd Buggy Kit New NIB Rare! Racing has changed. The Cougar KC is designed primarily for modern carpet and astro surfaces. All the parts required for all the layouts are included as standard in the kit - the Cougar KC has you covered on Carpet or Astro! Whether tight and twisty or open and flowing - the Cougar KD, takes dirt seriously. Sleek, ‘Shark Fin’ bodyshell. 26 super precision ball bearings. Two hole color coded shock pistons front and rear. Aerox Body and Schumacher wing. Join the race winning team. #Schumacherfamily and drive a CAT L1. The CAT L1 a revolution of the breed. FAB (Front Adjustable Brake System) with larger 22 tooth pulleys included. Aerox Body and Schumacher wing. Join the race winning team. FAB (Front Adjustable Brake System) with larger 22 tooth pulleys included. Alloy upper front housings with lower CofG. Lighter alloy rear upper housings for low CofG. Twist free rear pod layout with updated side link mounting points. 76t 64dp Kimbrough high efficiency spur as standard (options available). Lightweight front foam bumper.Ultra-balanced rear pod assembly. RARE in NEW , Never been built or ran Condition! Schumacher 1/6 Big Scale R/C Lotus Sport Elise Nitro 21 Race Car with 3 speed gearing. # 28787/K024D . This is a pre Assembled chassis, but nitro equipment still needs to be installed (parts to built are still in original bags!). Requires radio equipment,Glow Starter,Nitro Fuel, & Lexan Body Paint . Body measures approx. 26Lx13w. Purple metal chassis measures approx. 19Lx6W. Wheel Base is Approx 12W. Mint out of production kit. Up for sale is an used, LIKE-NEW Schumacher Cougar SV, 2wd 1/10 buggy, high end race spec, electric buggy, ROLLER. This RC is mint! Very well maintained and taken care of buggy! Side note, using ceramic bearings. Optional larger spur for more forward motor positioning in modified racing. Power Source: Electric. Top Speed: 70 MPH . Tools for assembly. Motor Pinion. Wheels & Tires. Motor position moved 3mm inboard reduces roll. Running out of room! I sold the response radio (TX) with a Manic I had just sold. I babied this girl! Crazy fast & fun. I just put a NEW GO 28. engine on it that runs great. Only ran a 1/2 gallon of TRX 20%. Optional larger spur for more forward motor positioning in modified racingSpecifications Power Source: Electric. Top Speed: 70 MPH . Tools for Assembly. Carbon fiber reinforced nylon wishbones reduce weight and increase flexibility. 1-pair Schumacher T628, front shock set. 1-pair Schumacher T629, rear shock set. You get exactly what is shown in the picture. 2 pair of shocks as shown, bagged by Schumacher in 1984-1985. Pictures are for reference. Original Schumacher tyres included. Transmission upgrade available to handle modern high powered motors, and create a class leading buggy for historic RC racing. Motor (Maximum 17.5T limit with kit transmission, 6.5T with speed secret pro transmission). (Not a re-pop, this is the real deal. Body is nice and clear and shiny. it's hard to take decent pictures of a transparent item.lol. :) As a Schumacher collector, you know how rare this is. Don't miss out. 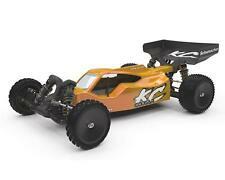 TheCAT K2 , is the latest 1/10th scale, 4WD, electric buggy from Schumacher Racing. With modern track trends theCAT K2 is optimised for high and low grip conditions. Schumacher Cougar KF2 1/10th Competition 2WD. The newCougar KF2 is a professional, high performance 1/10th scale 2WD racing buggy, based upon the ground breaking, multiple national championship winning Cougar KF. Schumacher Cougar KF2 - Kit #K155. The New Cougar KF2.Even further in front. NEW - Layshaft side mount with increased stability and rigidity for the spur, with improved tollerance. Schumacher,1:10,Electric,Buggy. Up for sale is a Schumacher G504T Connecting Rod, Pin & Clip : 21XT. Please check out my other listings and thanks for looking. Schumacher Mi6 Evo with newest stiff chassis and top deck. Also includes original Mi6 parts. Shumacher cougar kc rtr, with savox servo sc1258tg,hobbywing esc(xerun xr10 stock specs) trinity monster max 17.5 motor, fantom 5000mah shorty pack, transponder(3wire) spare parts( springs belt arms) futaba 4pls with r304sb , no trades, dremel,caliber, tools etc..